The Expedite Expo has always been a driver-friendly event but never more so than this year’s event, which will include the presentation of the first annual Expediter of the Year award. The finalists for this year’s award have been announced, and they certainly represent the very best of an industry filled with outstanding drivers. The winner will be announced at the end of Expedite Expo, which will be held Friday and Saturday, July 14-15, at the Lexington Center in Lexington, Ky. The winner will receive $500 cash for travel, two nights’ hotel accommodations provided by ExpeditersOnline.com, and an Expediter of the Year Plaque. 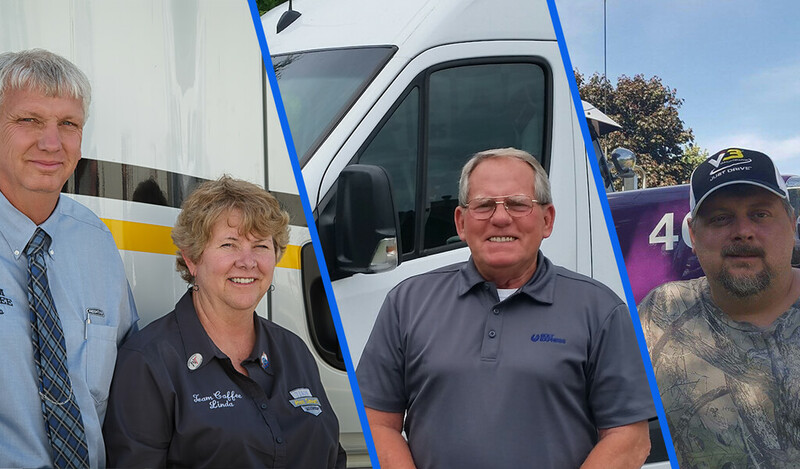 This year’s finalists are Robert Burton of V3 Transportation, Bob and Linda Caffee of Landstar and Edward Estes of Bolt Express. Robert Burton was nominated by his wife and co-driver Christy Burton. Christy said her husband is always ready and willing to help anyone who needs it. Robert said he has been with V3 Transportation since August 2016, after eight years with XPO Express. He drives a 2005 Western Star and limits his speed to 65 or 66 miles per hour to conserve fuel. On the road, Robert enjoys flying his drone and taking pictures of the scenery. He has a passion for volunteering, whether it’s installing fans at the local gun club, helping Girl Scouts build rockets, buying school supplies for needy children, or participating in a touch-a-truck event at his local library. Bob and Linda Caffee were nominated by Jeff Hurley, vice president of LTL, Expedited and International Services for Landstar. The Caffees began their driving careers in 2000 and moved into the expedite market in 2005. The Caffees drive a 2015 Cascadia Evolution that they enter in competitions and safety challenges to promote good and safe driving. “They serve as advisors to other drivers and are always available to support the trucking industry,” Hurley said. The Caffees are active in Women in Trucking and support the St. Christopher Truckers Development Relief Fund. Both are lifetime members of OOIDA and Linda is president of the board of directors for Trucker Buddy. They also are members of the Western Truck Alliance and Trucking Solutions Group. The Caffees are eager to help new drivers, and to promote expedite trucking. Bob and Linda have received some media attention during their careers, and they take the time to help give their industry a positive image. Another way the Caffees promote a positive image is by dressing for success. The Caffees’ clothing bears the logo of their company. Both wear slacks and button-down shirts, and Bob wears a tie each day. “We have spoken at workshops and at meetings about the importance of dressing for success and being the face of the company,” they said. The Caffees have also been involved with Trucker Buddy for many years. Edward Estes was nominated by Chad Brown, director of driver relations for Bolt Express. “Ed has completed over 70 shipments for 31,523 accident/incident free miles in 2016 and has a 96 percent on-time percentage rating with zero turndowns,” Brown said. “Ed is the most professional driver that I have ever met during my 20-year career in the transportation industry. He is a loving husband, father and grandfather. When Ed and his wonderful wife Dianne are at home they volunteer at their church the University Church of Christ in Montgomery, Ala., helping the elderly church members with their transportation needs. Ed represents Bolt Express and the transportation industry with a high degree of professionalism and integrity. Estes said he has been with Bolt Express for six years. He has been accident-free with no citations for his entire career of professional driving. Estes currently drives a 2012 Mercedes Benz Sprinter Van. Estes is a member of the ExpeditersOnline. com forums and a former member of the National Purchasing Managers Association. “Currently I continue to volunteer for various needs for members of my church. I have also assisted stranded motorists whenever possible. One such instance was following a school teacher home for over 100 miles. She was returning from a teacher’s seminar and was stranded with an overheated radiator. I helped with a temporary repair and then saw that she got home safely since it was dark and her route was partially on rather isolated roads. I have also volunteered at the Expediter Truckers Show in Wilmington, Ohio and Louisville, Ky. Previously I coached Little League baseball and soccer teams, provided aid to tornado victims, and donated blood. For more information about Expedite Expo 2017, visit www.ExpediteExpo.com.